Before you phone a psychic or start shuffling those Tarot cards take a few moments to get clear about your intention in seeking advice. Keep in mind that psychic counselor talents do vary. Do your homework as a consumer. Shop around to find the appropriate psychic advisor prior to booking your consultations. If you would prefer doing a self-reading there are a wide variety of oracle tools to consult for intuiting answers. Am I going to get pregnant? Although these or similar YES or NO questions may be bouncing around in your head you know in your heart that you are not going to be content with a simple YES or NO answer to such pressing matters. Don't even go there. The answer, be it YES or NO, will only lead you to additional questions that are going to leave you feeling even more anxious about your future, When will I marry? Who is he cheating on me with? How about twins? Is adoption in the picture? Should I quit my job? How much money? and so forth. Either/Or questions are fun to ask when the answer will not weigh heavily on your mind. Doing a pendulum reading over the belly of a pregnant woman has been done many times to divine the Boy or Girl? gender question. But, in general (other than questions like Boxers or Briefs? White or Wheat? Paper or Plastic?) you will not be satisfied with a quick answer. If you want detailed responses to your inquiries, begin your session by giving your reader enough information to be able to hone in more deeply with his intuitive skills. SHOULD I move in with my girlfriend? Why am I unsatisfied with my work? How can I learn to get along with my coworkers better? What are my best employment opportunities? Don't ask WHEN, WHERE and WHO questions -- WHY not? WHERE will I find success? Asking questions like WHEN am I going to be happy again? Or WHERE will I find my soul mate? are "gotcha" questions that may prompt responses that could paint you into a corner. If a psychic reader gives you a specific answer to this type of a question consider what you might do with this information? As frustrating as it can be not knowing the WHEN, WHERE, and WHO it is better not to ask. The answers to these types of questions may actually take you down a garden path that could eventually lead you to an unsightly patch of overgrown weeds in an abandoned parking lot. Why so? Well, depending on how emotionally reliant you are on an answer given you may be forfeiting your own best instincts over to some other person's inclinations. Not asking a WHO question should be obvious. You don't ever want to focus on other people when seeking futuristic advice about yourself. Keep the reading focused on you and your choices. So, keep questions like WHO is the gal of my dreams? in your mind but don't lay it out on consultation table. Otherwise you might be given a name or a description that will end up limiting your playing field or confusing your search. You may be looking for that "blonde girl" but can't find her because she dyed her hair red, or she introduces herself to you using her middle name and you don't give her a chance long enough to learn her first name. Just don't ask WHO, okay? 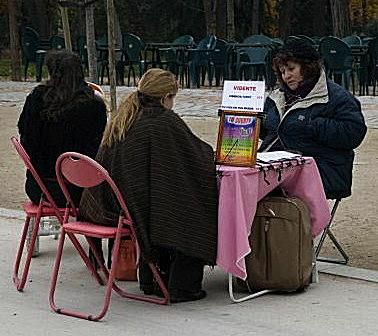 Here's another example of getting mixed messages from a psychic giving clues about WHERE your soul mate will be found. Let's say you were told you would meet your soul mate while traveling or away on vacation. Based on what your intuitive counselor told you would you start taking more vacations and weekend getaways even though you could not afford it? Or, would you possibly begin avoiding all local social activities because you now BELIEVE you won't meet your perfect prince at your neighbor's barbecue? Why waste your time right? What if the psychic was wrong? But let's say the psychic was right and you were suppose to meet your soul mate while away on holiday. But the scenario she was intuiting was a bit different from what you imagined. You were suppose to meet Susan at your neighborhood barbecue. Susan and you then become BFFs. Susan invites you to go with her on a family cruise over Spring break. This is when you meet her handsome brother Steve who fantastically turns out to be your soul mate. Because you decided not to go to the local barbecue, you never meet Susan. Without Susan as your cupid's path to Steve, meeting him just got delayed. Or, you might end up missing the Love Boat entirely. A divorced woman I knew once asked a psychic counselor if she would marry again (a very common YES or NO question). The psychic's answer was yes. Fair enough. But then this querent asked WHO is it? And, WHEN will I meet him? The psychic, smartly, stayed clear of giving her a specific time frame for meeting her prince charming second husband. Instead, she told this woman that she and her new guy had some karmic lessons each of them had to experience on their own first before their chance meeting would occur. Then she brought up some karmic issues for the woman to concentrate on clearing in preparation for her new relationship that was waiting in the wings. I think I like that psychic! WHAT am I doing right (or wrong)? HOW do I begin loving myself? WHAT can I do to attract a mate and fall in love again? HOW can I best fulfill my desire to experience motherhood and nurture a child? WHAT am I lacking in my life that is affecting my unhappiness at work? Question: Why is my boyfriend avoiding me? Better Question: I'd like to spend more time with my boyfriend. How can I improve my relationship with him? Question: Why did my boss deny my request for promotion? Better Question: What can I do to become more successful? Question: How can I make my parents and siblings respect me? Better Question: Why am I struggling with family relationships?